This Distinction Magazine Article by Janine Latus and incredible photography by Keith Lanpher is a true glimpse into our daily lives on the farm and contains some very kind words from our friends and colleagues! 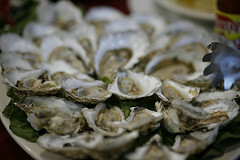 Here is a great article on both Nassawadox Salts and Sewanscott oysters in the Virginia Pilot! Here are some Nassawadox Salt oysters being served at Chatham Vineyard for Gov. Bob McDonnell May 5 2010! Chef Bill Smith of Crooks Corner took a ride on the Oyster Queen and out to the seaside on a visit to the farm. Check out the nice things he had to say about the Eastern Shore! Have a look at this incredible blog by Chef Molly O'Neil, author of One Big Table and be sure to scroll down and check out the oyster section featuring Nassawadox Salts! A recent article on Nassawadox Salts and other oysters grown by our Eastern Shore friends! A great video on some of our Eastern Shore friends including our own Nassawadox Salts! Lorraine Eaton again reminding readers how wonderful, safe, and divine our Eastern Shore oysters are!